Side Pipe parts kit and GTS conversion from rear exhaust to side pipe. 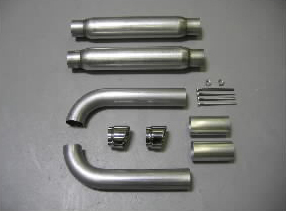 In the late 1950's Jerry Belanger and brother Gaston pioneered the industry with the most advanced header designs used today; with their invention of the Tri-Y. Belanger Performance Headers & Exhaust makes some of the best headers and exhaust in the industry for the Challenger SRT, Dodge/SRT Viper and Ram SRT.